This morning, GREY2K USA released an analysis of greyhound injury reports we received from the West Virginia Racing Commission, covering the entire year 2011. During this time period, a total of 855 greyhound injuries were reported by the state, including dogs that suffered broken legs, lacerations, tears and dislocations. More than two hundred greyhounds suffered career-ending injuries, and forty dogs died or were euthanized. Our analysis was reported by the Charleston Daily Mail, and is being covered by news outlets across the country. I'm grateful for this reporting, but am heartbroken that dogs are still dying at West Virginia racetracks. This is not a new problem, and in fact greyhounds have been dying for years at two tracks in the state, Wheeling Island and Mardi Gras. These dogs are more than just statistics. It's tragic that Iruska IC Beauty, a brindle greyhound who was only two years old when she died, will never know the comfort of a loving family and permanent home. Instead her life ended on April 16, 2011, when she suffered a spinal injury during a race at Mardi Gras. Sadly, it appears that there is no immediate end in sight for fatal injuries like the death of Iruska IC Beauty. West Virginia tracks have taken some measures to reduce injuries in recent years, and should be applauded for those actions. It's now clear, however, that these improvements will not significantly address this issue. Instead, track surface changes have merely trimmed around the edges of a continuing problem. "We know that this, like a lot of other similar activities, people ascribe a moral component to it - whether it be greyhound racing or gambling or anything that goes on at Mardi Gras - and we're unsurprised that they take that position and we disagree and we know that there are a lot of patrons that enjoy it and for those that don't, certainly no one is forcing them to participate." I agree with Mr. Amores that humane minded citizens should opt to not "participate" by attending dog races. There is a fundamental flaw in his reasoning, however. The fact is, dog racing only exists in West Virginia today because greyhound breeders are being heavily subsidized with millions in casino gambling profits. Also, the tracks are also forced to continue holding races as a requirement of their gambling licenses. This policy of mandate and subsidize means that dog racing will continue indefinitely in West Virginia, regardless of how many people are attending races or betting on their outcomes. Finally, it's crystal clear that the tracks will not address this problem themselves. That reality is evident in comments made by track owner Dan Adkins to the Daily Mail. 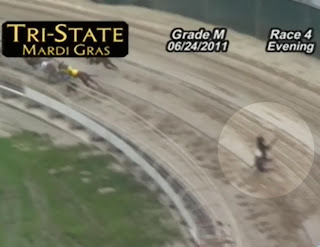 Despite the fact that more than 500 injuries were reported at Mardi Gras in 2011, including fifteen dogs that died, Adkins told the newspaper that the track was doing "pretty damn good" when it came to injuries. He also dismissed the problem by saying the injuries were "not all career ending." This rationalization is cold comfort for the dogs that died at his track, like Iruska IC Beauty. 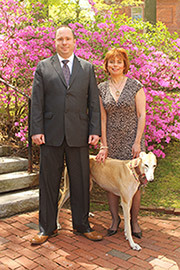 The bottom line is that until the law is changed hundreds of greyhounds will continue to be seriously injured, and die, in West Virginia. Everyone who cares about dogs should be appalled by this situation, and should contact their state lawmakers to ask for their support in ending greyhound racing. Otherwise, it's a sure bet that a year from now I will be writing about the hundreds of dogs that were injured, and the dogs that died, at West Virginia tracks in 2012. LETS GET THIS SPORT BAND EVERYWHERE those poor dogs, why are people so mean to animals, what did they do to you?